The fifth chapter in the Expedition Class series was a battle for survival, not zooming about by bike, kayak or foot, but plodding slowly from task to survival task. The challenge was not to be finished in time; this was no race against the clock. There was no clock, just a diary to record the days passing and the body weight dropping. Around me, sometimes close by but usually on the horizon at Bona Bona or under paddle beyond the reef, the villagers went about their lives. Gardening, fishing, hunting and playing. I raided the coconuts planted by their grandparents, fossicked for the siaia (chestnut) and lured their reef fish onto my hook. Without them life would have been unbearably difficult. It was, to be honest, hard enough. 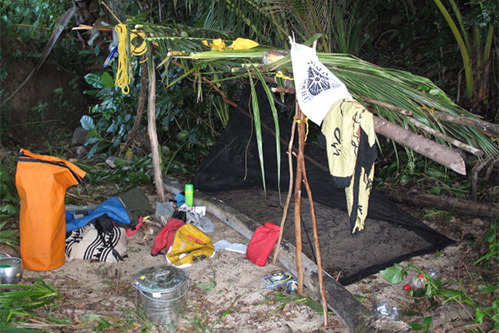 The Crusoe Project saw me living under a shelter on Delami Island off the south east coast of Papua New Guinea.